Still dreaming of that Big Screen HDTV? Looking for the perfect Home Theater Design solution? Considering a complete Home Theater Automation System? You've come to the place! Our showroom offers a casual, stress free environment that you just won't experience at the "big box" retailers. We offer one-on-one personal service to help you with selecting the perfect solution to your home theater needs. Whether you are looking for that perfect HDTV or need us to design and install the perfect home theater in your home, our professional consultants have the answers. Our consultants have years of experience in the home theater business and take great pride in what we do. So what are you waiting for? 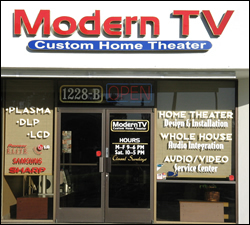 Come in and experience the Modern TV difference! 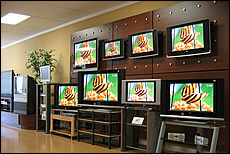 From LG and Samsung to Panasonic and Pioneer we have plenty of HDTV options to choose from. Let one of our friendly, professional consultants help you find the perfect solution for you and your family.